Hatton’s name is a corruption of ‘heath ton’ and was first recorded in Domesday Book. Edward III seems to have built a (long-lost) house here, which was known as Hatton Grange and was later granted to the priory of Hounslow. The hamlet lay on the edge of Hounslow Heath at the junction of several byways with the road to Staines and Bath. The Green Man inn, which dates from the late 18th century, is said to have been a favourite haunt of highwaymen. A timber-framed building at the north-eastern end of Hatton Road was converted to a mission church but no longer serves this purpose. Over the second half of the 20th century the old hamlet was almost entirely erased by the construction of warehouses and other service buildings for Heathrow Airport, one of which covered a prehis­toric earthwork. Hatton Cross station opened in 1975 on the Piccadilly line extension to Heathrow, and provides a bus inter­change for the main-line rail service via Feltham. 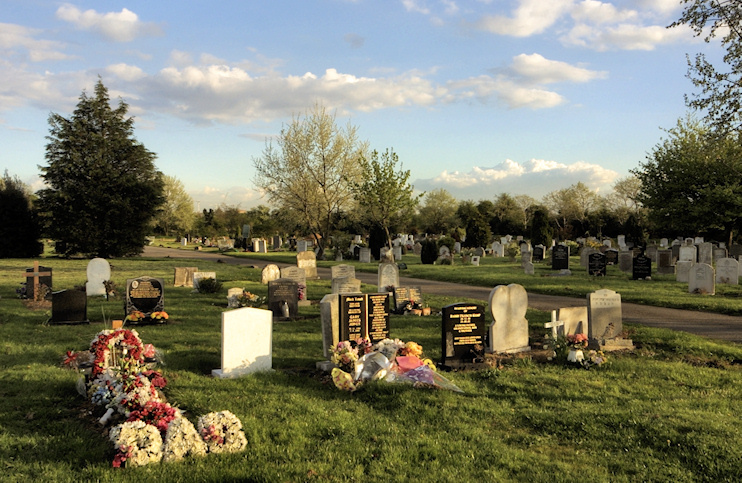 Hatton Green has a cluster of housing and Hatton cemetery lies further south, behind the Urban Farm Hounslow. Shown in the photo­graph above, the cemetery opened in 1974. It has 22 acres of ground, including Islamic sections laid out with the graves oriented towards Mecca.